Overall the Huawei MediaPad M3 is a capable Android tablet that's good for entertainment and mostly free from fuss. The tablet market has stumbled. From everyone offering a tablet - in Windows, Android, iOS - things have dwindled. Even Apple's iPad has slowed in pace. The shift has been toward offering tablets that replace your laptop, devices designed for productivity, the iPad Pro, the Pixel C and any number of Switch and other hybrid devices. Sometimes you just need a tablet to play and that's exactly what Huawei's MediaPad is designed to do. The MediaPad M3 saw its announcement at IFA 2016 and we've been living with it to see if it fills that entertainment hole. Huawei is slowly turning into a metal master, with a range of devices that are beautifully crafted. The MediaPad M3 fits into this category, offering up the 8.4-inch tablet with a unibody metal design. The metal bodywork is sandblasted to a fine smooth finish, with Huawei's (now signature) diamond cut chamfer on the leading and trailing edges of the sides. There's very slight curve to the rear edges to make this tablet easy to hold one-handed, but still sit fairly stable when you have it flat on a table. Gone are the ridges of the smaller MediaPad M2, which we think leads to a better overall result. The MediaPad M3 measures (approx.) 214 x 124 x 7.5mm and weighs 322g. Where many tablet manufacturers have opted for the 4:3 aspect (like the iPad), Huawei is offering a slightly wider 8:5 aspect. This makes for a widescreen look when holding the tablet in landscape, great for gaming and movie watching, but perhaps less friendly in portrait when reading. We'll also mention the chocolate box packaging. Huawei has impressed us with quality presentation before: we're talking about Apple-rivalling presentation, which is important in reinforcing the fact that Huawei is a serious technology company, with some seriously attractive hardware. Overall, it's a thumbs-up for design for the MediaPad M3. Flip the MediaPad M3 over and you'll see Harman Kardon on the rear. The M3 offers twin 1W speakers tuned by Harman Kardon, sitting on each end. They are designed to deliver your stereo audio with a punch when holding the tablet in landscape. These speakers cope well with game and movie sounds and offer plenty of volume. We like that, because you can fire up something like Real Racing 3 and listen to the visceral screaming of the cars on the track with plenty of detail and immersion. The same applies to movies and TV. Watching YouTube, Netflix or Amazon videos, you'll find that you don't need headphones, as the sound quality is perfectly good. The positioning slightly off-centre makes space for your hands to grip the tablet too, with Huawei telling us that it knows how you're holding the tablet so it can adapt the sound accordingly. If there's a criticism of the speakers it's that they get a little shrill on the highs at top volume and the bass drops away, but that's typical of small format speakers. As such, the MediaPad M3 isn't great for listening to music through those speakers. It's possible, it's loud, but it's not the best quality. While talking about headphones, let's not forget to mention that there's a pair of AKG headphones in the box (AKG is a Harman company, so it makes sense). But that's a savvy bit of pairing by Huawei – why provide your own when you can make a show of offering quality headphones from a partnership? These AKG headphones are compact, look great and come with a great corded cable. Their compact format means the audio delivery can be a little thin. Again, it's bass that suffers, although we managed to get a good fit and enjoyed the lighter sound they offered - certainly better than many sets of bundled headphones you'll find in boxes. With an 8.4-inch display, Huawei goes the whole hog in offering a 2560 x 1600 pixel resolution display. That gives you 359ppi, which is higher than many tablets offer. With content appearing at a range of resolutions, you're only likely to be streaming at in HD quality, but some apps will take advantage of the extra detail this display will offer. There's plenty of brightness from this display, so using it in sunnier conditions is possible, but one of the highlights of this tablet is its low light mode, which will take things down as low as 4 nits, ideal for using it in bed. That said, we found ourselves manually bumping the brightness up a little in darker movies, just to bring a little more detail back in dark scenes. There's also an "eye protection" mode, or blue light filter, to try and help avoid it frazzling you when watching late at night. It doesn't appear to offer an automatic mode, however, so you'll have to manually toggle it on - and there's no adjustment as you'll get from Samsung's latest devices. For all the resolution and features, this isn't the best display around. The viewing angles are a little restrictive, greatly favouring direct viewing. Whether this is designed for privacy, or is just a byproduct of the display used, it can mean that the usually good presentation of colours and details drift off if you're not viewing straight on. The MediaPad M3 is equipped with one of Huawei's own brand HiSilicon Kirin 950 chipsets, offering octo-core 64-bit power and supported by 4GB of RAM. On review here is the LTE version of the tablet, so it also features a SIM and microSD card tray in the base. There is 64GB of storage. When it comes to performance, we very often ask less of a media tablet than we do of a smartphone, because we're not using it on the move and carrying out a lot of simultaneous tasks. It tends to be domestic use, but centred around longer gaming sessions, prolonged movie watching or browser use. These are the jobs that the MediaPad M3 is well suited to and firing up our favourite game Real Racing 3 sees swift loading times, smooth animation and plenty of detail in the graphics, oh and that lovely sound we mentioned previously. Slick performance of that kind is reproduced across this tablet across a range of media and apps, although it's perhaps not as graphically powerful as it could be. The other side of this tablet, of course, is the 5100mAh battery. That's a generous size and we've found it lasting us several days with regular use. There doesn't tend to be the same demand from tablet batteries as there is on smartphone batteries (for the same reason, you're mostly using it at home) and this is typical of a tablet of this size. There's a Micro-USB on the bottom, which is perhaps an oddity as Huawei is generally moving towards Type-C on its other devices - like the Nova handsets also revealed at IFA 2016. Like other Huawei devices, this also lets you reverse charge, so if you connect a phone you can change it from your tablet's battery. A niche offering, perhaps. Huawei adds some interesting features to the fingerprint scanners on its devices. Not only does it unlock nice and quickly on the M3, but there's some additional goodness too. As the MediaPad often hides the navigation controls for Android, the fingerprint scanner offers most of the navigation functions you'd normally associate with those Android's buttons. Swiping the fingerprint scanner across will allow you to switch to the last app you were using, basically like using the recent apps button. A tap will take you back; a long press will go home. Once you get used to these functions, it's a surprisingly fluid way to interact. Huawei has fallen into the habit of offering devices for review with the caveat that it's pre-release software. That applies here too and although we've been living with the tablet for some time, bear in mind that we've been testing it before public release and some things may change. On the software front the Huawei MediaPad arrives with EMUI – Huawei's own Emotion UI which you'll find on its other devices, including those from the Honor sub-brand. On a tablet EMUI works well enough, offering portrait or landscape home screens, although we're still not taken with the removal of the apps tray. Rather like the iPad, that means you just swipe across screens of icons. Of course you have the advantage of widgets too and if you feel strongly about the visuals, you can always change the launcher to something more "Androidy". This being the LTE version of this tablet, you'll find it filled with full phone capabilities too, so you have a dialler and messaging apps too, whether you think you'll need them or not. You can switch off the network information from the status bar, however, which helps keep things clean. Final software or not, we found this tablet to run smoothly enough. As we've said, those main tasks that we want from a media tablet are nicely fulfilled and that's what really matters. Huawei doesn't supply anything too exciting in its own bundled apps, except, perhaps, they're mostly unnecessary. There is WPS Office, where you'll be better served by Microsoft or Google Docs, there's a Gallery, but Google Photos has you covered. There's a music player, although again, installing a music app like Play Music or Spotify will serve you better. There is the option to secure apps, however, setting a password for them which is useful for those who want to segregate some apps, perhaps if you're sharing this tablet between work and play, or you don't want the kids reading your emails. In one sense, if you're sticking to the apps that are the most important to you then you'll find things run as smoothly as you might want. On the other hand, Huawei doesn't add a huge amount to the mix for entertainment. There's no claims of boosting the visuals as you'll get from Sony, there's little audio tweaking, aside from the SWS mode, which isn't very good. There is support for split screen, however. A press and hold on the recent apps button and you'll get the option to add supporting apps to this view. Want to control your music and browse Google Maps? That's no problem. The camera is so much of an afterthought on the M3 that there's no flash and you don't get all the features you do on a flagship phone like the Huawei P9. That's fine with us, because we rarely see cause to use it. If you do, there's an 8-megapixel camera on the rear and an 8-megapixel on the front. The performance is actually pretty good, so if you're one of those people who likes to take a tablet to the zoo and take pictures of things so no one else can see, then the M3 will give you some good results in fair light. The front camera is also competent. It comes equipped with Huawei's beauty offering to make you look better, but there's plenty of detail on offer for those occasional selfies, wherever you happen to be. Then we come to the price. Drift too high and you get too close to iPad territory – and the iPad mini 4 is £319, Samsung's Tab S 2.0 is around £300 and those are tablets that perform well. The Huawei MediaPad M3 comes in a number of different versions, but starts at €349 with 32GB storage and Wi-Fi. Exactly what the UK prices will be given exchange rates, but we'd hope that the M3 will undercut those rivals. 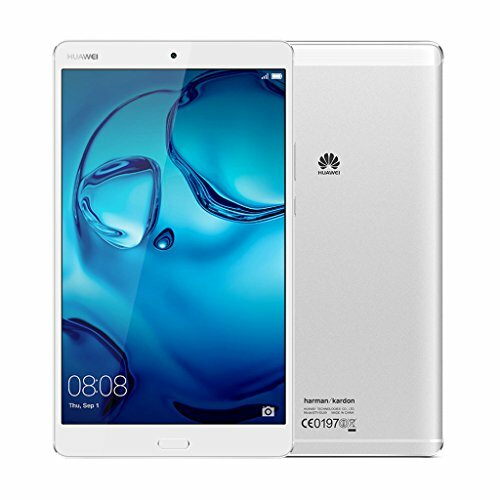 The Huawei MediaPad Available beginning 26 September. For the 64GB LTE version on review here, you'll have to pay €449, which is pretty expensive, but for that you get good performance, plenty of storage and connectivity on the move.